Is there an updated firefox in the Ubuntu 14.04 repository? I was on firefox 39 and wanted the latest 53. I uninstalled 39 and tried to install the latest from tarball download. I couldn't be bothered with all the simlinks and terminal stuff so I looked to reinstall from the repository but it only gave me firefox 28. What's the most up-to-date firefox I can install from repository? 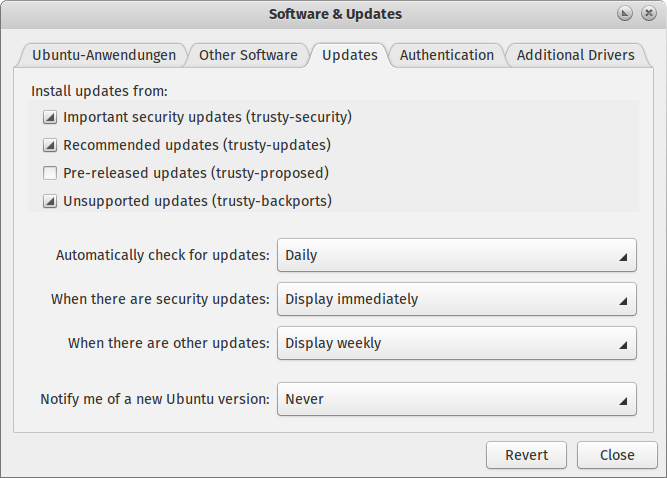 According to Launchpad v28.0+build2-0ubuntu2 is still the default Firefox version in Trusty if you don't enable security updates. Please enable security updates (see below)! Open System Settings > Software & Updates or run software-properties-gtk and go to the tab labelled Updates. A dialogue will ask you to enter your password to confirm this action because it requires super-user privileges. Open Update Manager or run update-manager. This should update the package repository information and subsequently prompt you to install available package upgrades. There's also a list of available upgrades and the most recent Firefox version should be among them. Will the official repositories update to Firefox 4.0 when it's released? What's the ultimate way to install debug Flash Player in Firefox? 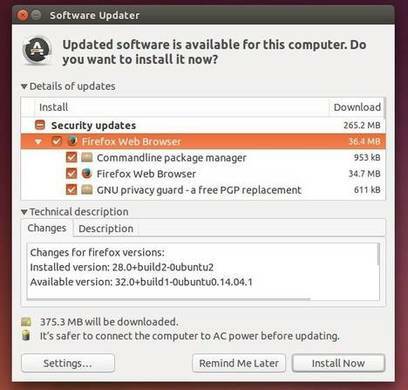 How can I upgrade to Firefox 34.0.5 on Ubuntu 14.04? How to update Firefox to latest version in Kubuntu 15.04 unstable the usual way? Why is package 'xul-ext-ubufox' is required to install the Firefox package? How to use a downloaded Firefox and be able to launch it (with its icon) from the Unity toolbar?